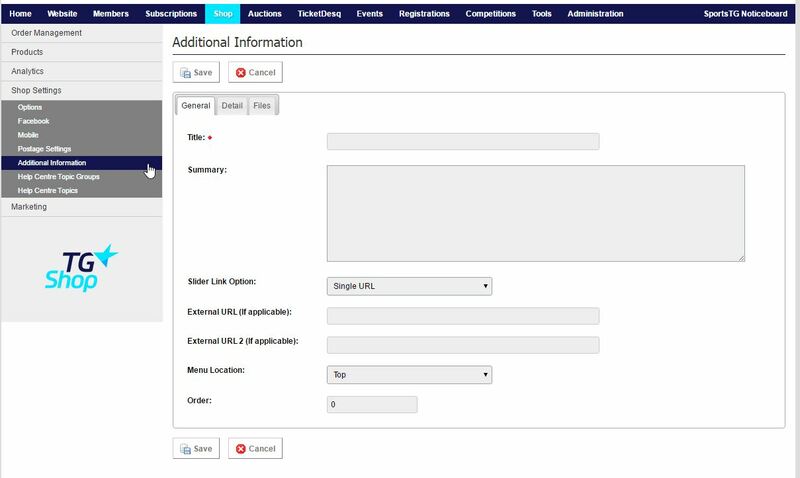 Additional Information gives you the ability to add additional pages to your Shop portal, including linking through to other STG hosted portals, or setting up a Terms & Conditions or Further Information page. 2. Select Additional Information from the expanded left menu. 3. Click ADD to add a new Additional Information page. 4. Give the page a Title, then complete the other details for the page. 5. Go to the Details tab to add any information that should be contained on the page. 6. Click Save to add the new page. 7. Make sure the item's status is changed to Online (green tick) in the Listing.